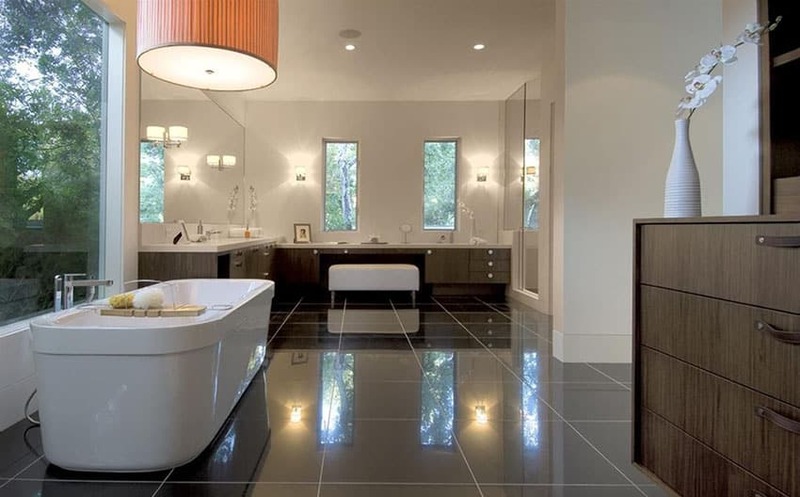 Here we share popular types of bathroom tiles including pictures of floor and wall tile, pros and cons and design ideas. The bathrooms in your house are frequented by many, so you want to make sure they look good. 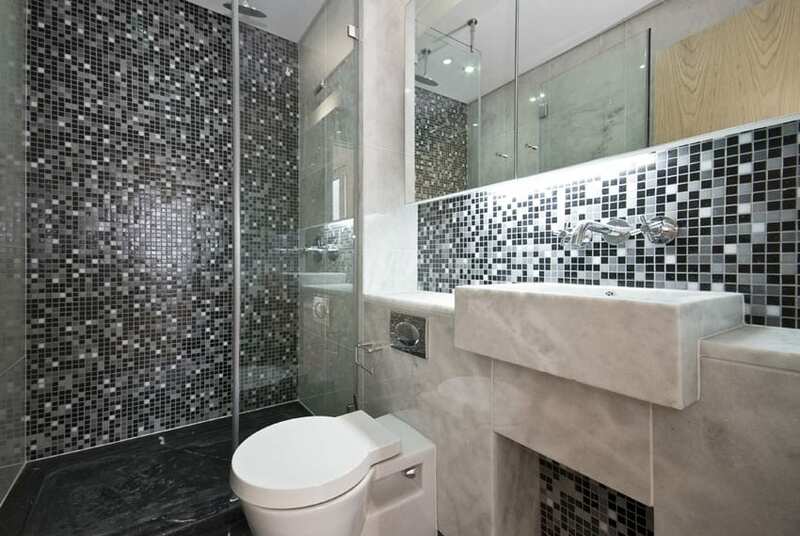 A big part of the design of your bathroom is the flooring and wall tiles you decide to use. However, there are some extra considerations you have to keep in mind – the main one being that this flooring has to handle water well. Below we take a look at some options you have that will look great and withstand what a bathroom is put through. Let’s start off with a classic option for a bathroom floor: porcelain or ceramic tile. These choices are so popular because they are attractive and budget-friendly at around $1.09 per square. You can get these tiles in almost any shape or pattern that you can imagine. If you are looking to complete your new flooring as a DIY, there are versions that are sold in which you don’t have to lay down each tile individually. These are pre-mounted onto a plastic mesh sheet that can be simply laid down and sealed into place. There is a slight difference between porcelain and ceramic in that porcelain is a type of ceramic that has a higher than average absorption rate. According to the Porcelain Tile Certification, porcelain tiles have an absorption rate of 0.5% at most. This makes them a great choice for bathroom floors. For more pictures visit our gallery of bathroom floor tile ideas. One of the biggest draws of porcelain and ceramic tiles, as we’ve mentioned, is their versatility in design. 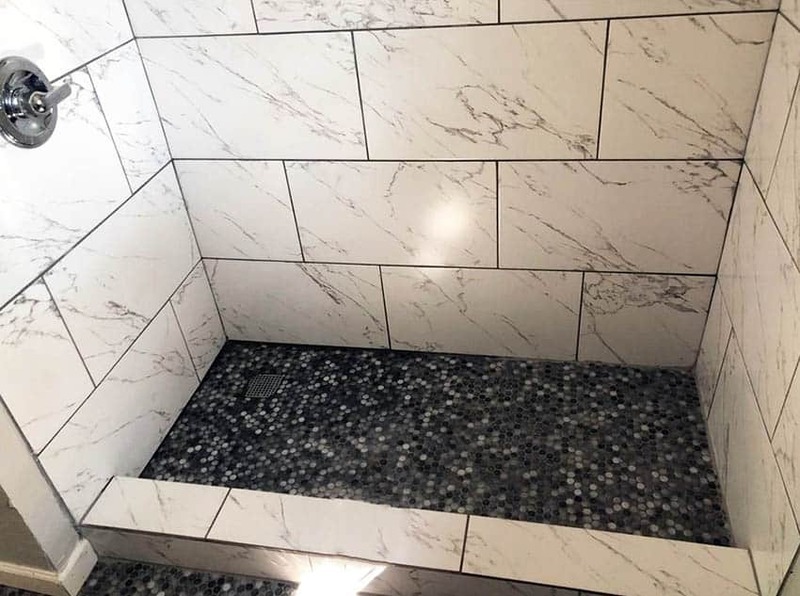 Not only do they come in different tile shapes, but many homeowners also use details such as tinted grout to make their designs unique. Another great thing about ceramic and porcelain is that it’s easy to clean. Regular sweeping and mopping will do the trick alongside occasional grout cleaning. There are a few disadvantages to these materials. For one, they are rather slippery – especially when wet. 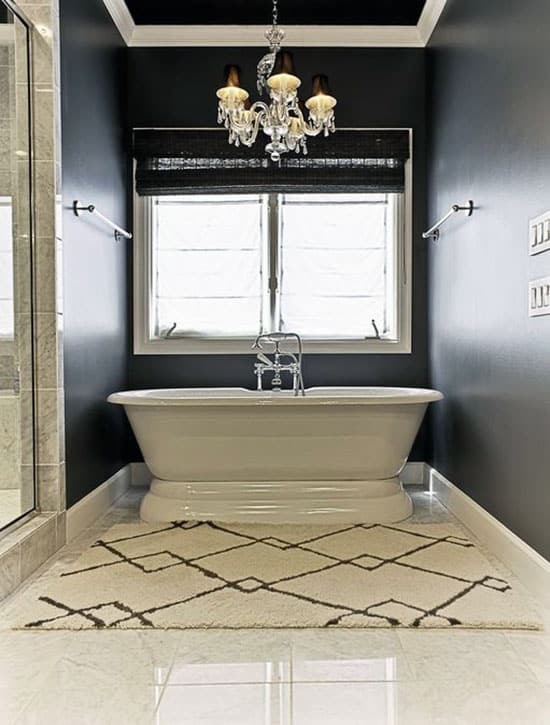 Luckily, this is something that many homeowners circumvent by using a bath mat or raised texture floor tiles. Some also dislike that ceramic doesn’t retain heat, so it’s chilly when you walk into the bathroom in the middle of the night. Vinyl tile is another popular choice for bathrooms. This is, in large part, due to its practicality and attractiveness. There are a few types of vinyl flooring that you can choose from when it comes to vinyl flooring. It’s also rather affordable at an estimated $0.95 per square foot. For one, there is sheet vinyl flooring. This is the recommended option if you are expecting a large amount of water on the floor. This lends it to bathrooms – especially kids bathroom. One of the reasons that this is the case is because these don’t have many seams for water to seep into. Thanks to the large sheets it comes in, some bathrooms may have no seams at all. On the other hand, there is luxury vinyl plank flooring. This is a flooring style, instead of coming in sheets, comes in narrow planks. These are usually around 5 inches wide and up to 48 inches in length. Aside from how well this type of flooring works at handling water, it also comes in almost any style. So, you can find something that works for whatever decor style you use in your bathroom. While you can install vinyl flooring as a DIY, you need to be careful. Getting the seams tight is absolutely crucial. If the seams have gaps, it isn’t going to be as resistant to water as you want it to be. Natural stone tile is a more expensive choice, but it’s also a beautiful one. There are many different types of stone that might be used in flooring, though, and to help you make the best choice, we need to take a closer look at some of your specific options. The most popular types of natural stone are marble, limestone/travertine, granite and slate. Marble tile is well-known for its beauty. It comes in a range of patterns and hues and it can seem like no two marble tile floors are the same. Some are even multi-colored. 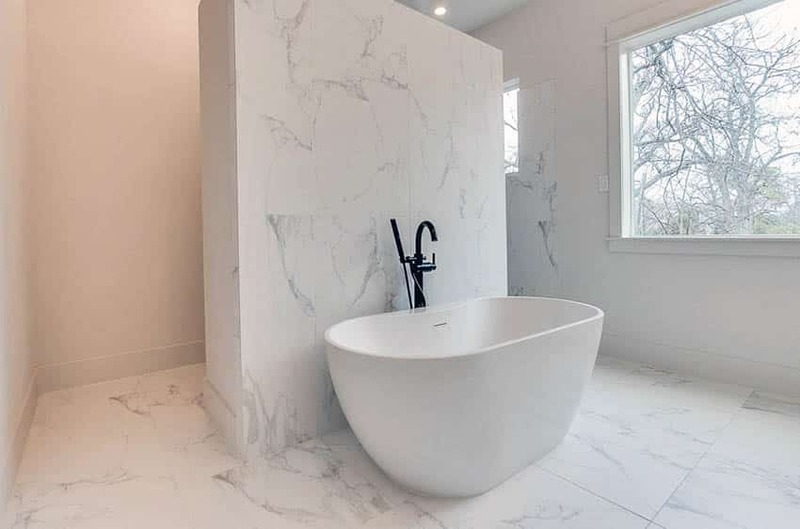 These aesthetic features make it easy to match marble to any color scheme. You can depend on marble to bring your bathroom a high-class look of regal elegance. Much like many other options we’ve looked at here, marble can be cut into different tile sizes and shapes. 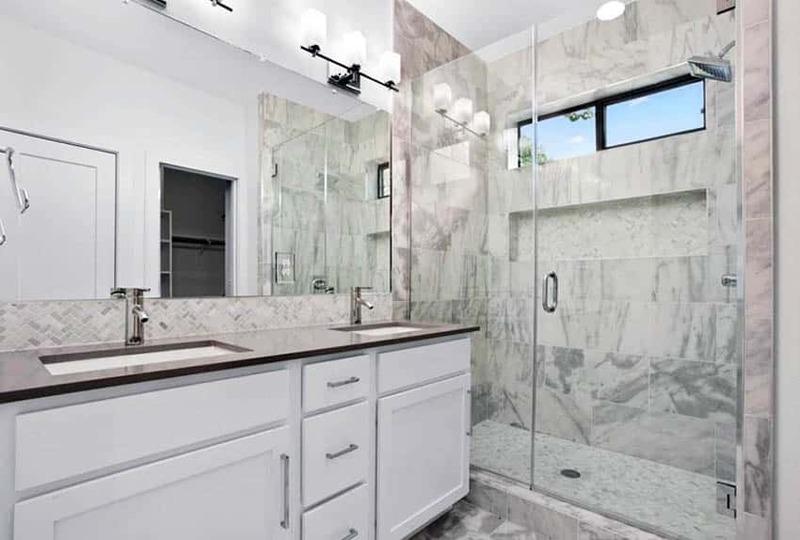 Marble is becoming a popular choice and is even used in bathroom showers and for countertops as well as on floors. You will want to make sure that the marble is sealed properly to make sure that it lasts as long as it has the potential to. Marble is naturally porous meaning that it isn’t well-prepared for water on its own. You’ll also want to avoid using harsh chemicals on it when cleaning. The biggest disadvantage of marble is that it is prone to cracking and scratching. Most recommend that homeowners buy extra tiles to make repairs as needed. You’ll also want to be careful because marble does get slick when it gets wet. Marble is a more expensive choice at around $10 to $20 per square foot. However, it is the cost for a more aesthetically luxurious finish. 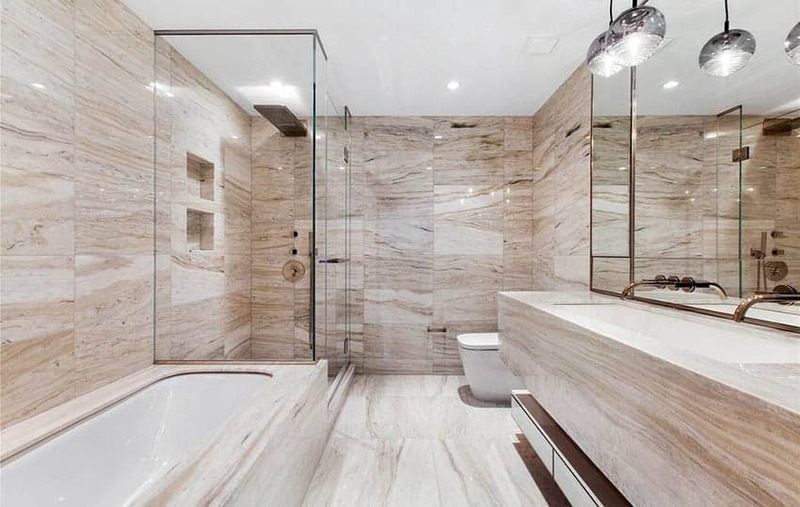 See more marble shower designs here. Limestone isn’t as colorful as stone options like marble. With limestone, you are likely to find lighter shades such as ivory and beige. This is a plus for many homeowners as it’s easy to match with any decor style. If you’re set on darker tones, though, you might be able to find red or brown shades as well. They are also used in many different tile patterns to offer even more visual variety. Much like porcelain is a type of ceramic, travertine is a type of limestone. It also comes in calmer colors ranging from off-whites to rust. On the topic of limestone appearances, this is another material that benefits from the natural stone appearance of each stone used has a different natural formation. With any type of limestone, you can depend on it to last a long time without showing a lot of wear and tear. Even if something were to chip or crack, the tiles are easy to remove and replace. To make limestone last in your bathroom, you’ll need to make sure it’s properly sealed and that it stays that way. Specifically, limestone needs a dual-sealing treatment. Frequent resealing will give your flooring a glossy look. As for the installation itself, you’ll probably want to leave that to the professionals since the tiles are so heavy. Limestone is also expensive, like most natural stones. 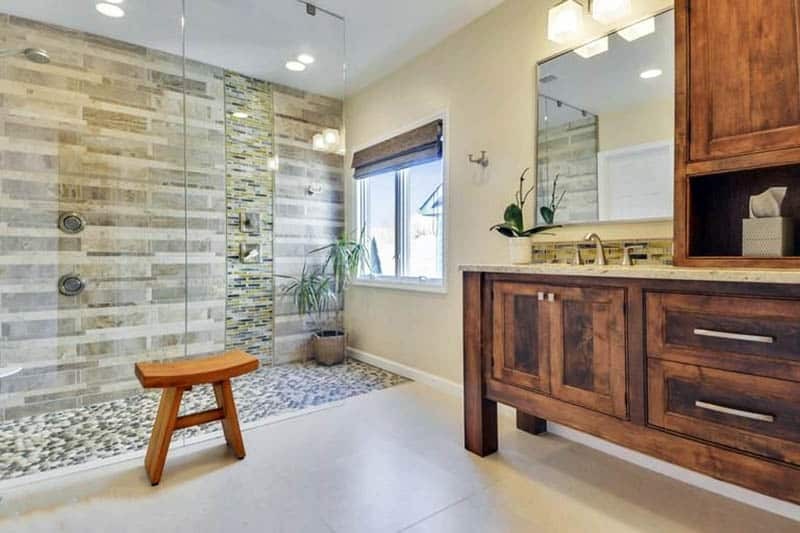 See this page for travertine shower ideas. Granite is a common material that you’re probably already familiar with when it comes to countertops. 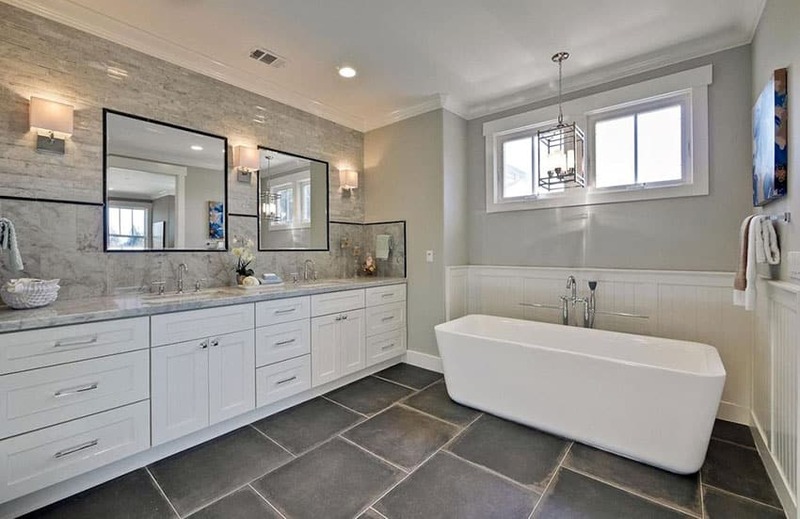 It’s also a natural stone that can be a beautiful choice for your bathroom floors. One of the biggest reasons that granite has the following it has is because it’s incredibly durable. Unlike the natural stones we’ve looked at so far, granite isn’t quite as porous. Its ability to withstand frequent moisture makes it a good fit for bathrooms. It also isn’t going to easily scratch or chip, so you’ll be able to rely on it for a long time. When it comes to appearances, granite is versatile. It comes in a range of colors and patterns thanks to variants in the formation of granite. The standard colors you can find granite in a range from white to black to beiges and browns and even blues and reds. Multicolored and patterned designs are common as well. Granite tiles are rather heavy, so you’ll want to make sure that your floor can support the tiles. For example, a square foot of .75-inch deep granite flooring weights almost 13 pounds. This weight can be harder to manage in older homes. It’s a good idea to consult professional help for this installation. A final, long-term benefit of granite flooring is that it can elevate the property value of your home. This is because you’ve installed something attractive that will last a lifetime. Slate is one of the strongest options you have when it comes to choosing a style of natural stone flooring. It’s naturally resistant to cracking, scratching, chipping, or breaking. It will stain left alone, but most installations include sealing floor against stains. This type of flooring does need to resealed regularly to keep it safe from staining. This material also has the benefits of other natural stones in that it comes in a lot of different styles. Due to natural formations, each piece of slate has a one-of-a-kind look, giving your bathroom a little personality. Slate flooring is a rather expensive option. After all, it lasts a long time and it’s considered a rather valuable choice. What can make up for the hefty initial purchase and installation is the value this design choice adds to your home’s property value. The balance of cleft finishes needs to be addressed for bathroom floors. Cleft finishes are rough – these are rough and uneven. These are meant to help give the floor some traction and is often a finished used in wet environments. The downfall of cleft finishes is that they aren’t very comfortable under bare feet. Most bathrooms don’t use cleft finishes, so this means you’ll want to beware of a slippery surface when you get out of the shower. You’ll also want to consider weight for slate just as you would for granite. It’s probably best to leave this installation to a trained professional. Mosaic tiles aren’t made of a single material. You could technically make a mosaic tile flooring out of almost anything – glass, tile, or stone. What makes these stones mosaic tiles is that they are used in small pieces to create a larger design. This doesn’t need to be the traditional sense of an artistic picture. The design may just be – and usually is – meant to be a creative pattern. Mosaic tiles are also easy to clean and won’t get ruined by your standard cleaning chemicals. Another great thing about mosaic tile flooring is that it’s a great way to use the material of your dreams at less of a price. Not to mention, the patterns created with these materials will be completely distinct, giving your home a personal touch. There are two main drawbacks to mosaic tile. For one, they are smaller, broken down versions of the material being used. This size makes them more susceptible to damage. You’ll need to be careful of cracking and breaking – dropping large items on the floor may cause problems. Scratches are also a common worry with mosaic tile. Luckily, if a tile gets damaged, it’s rather simple to replace. Secondly, mosaic tiles don’t have a lot of traction. This means you’ll want to be sure to put a bath mat down to reduce slips and falls. 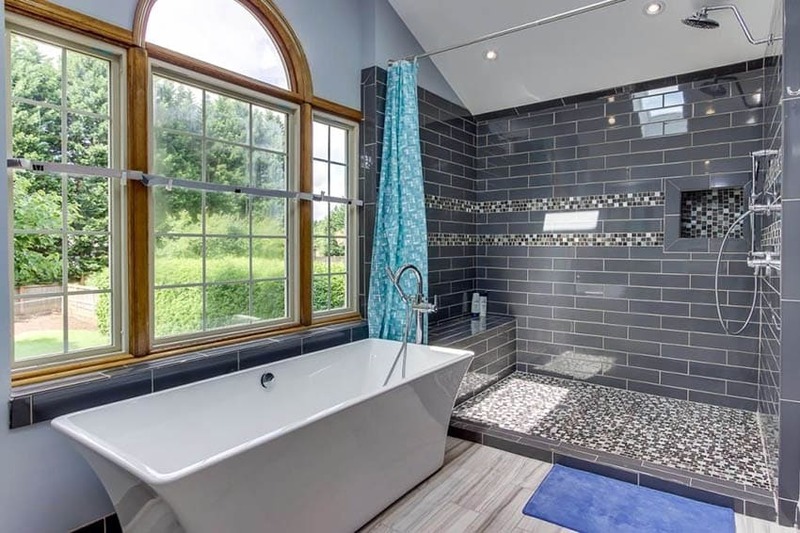 A fashionable and unique way to make your bathroom stand out is to use glass tile on the floor. These can be stained different colors and tones and the tiles can be shaped to add extra one-of-a-kind touches to the design. Glass tiles are also recommended for adding depth to the design as well. It’s important to make sure you get glass that’s rated for use on floors. The glass in your windows isn’t the same glass that’s used for floors. This material is one of the more expensive options, ranging from $7 to $30 or more per square foot. The biggest draw to glass tile is how gorgeous it is. Not only that, it can be manipulated in so many ways that you can find a style that fits almost any design you can dream up. Glass also doesn’t absorb water well, so you don’t have to worry about water destroying its appearance. While it can be slippery, if you use smaller glass tiles, it reduces how much of risk this poses. You’ll want to be sure to get glass flooring installed by a professional. This isn’t something that should be taken on as a DIY. In addition, you’ll want to make sure you have a professional that is familiar with working with glass flooring. Many general contractors don’t have the specialized skill to install glass floors. Wood might not sound like the standard choice for a bathroom. After all, it isn’t often considered usable in areas that are expected to be wet frequently. Well, the truth is, it depends on what type of wood flooring you are using. A smart alternative to using real wood flooring in the bathroom is by opting for a wood look porcelain tile floor. While bare wood isn’t a good idea to use in your bathroom, engineered wood might be an acceptable alternative. The reason that engineered wood flooring does well with moisture is thanks to the plywood base it features. The top layer is made of wood and looks like any other hardwood floor. You can get this flooring material in different colors and designs. 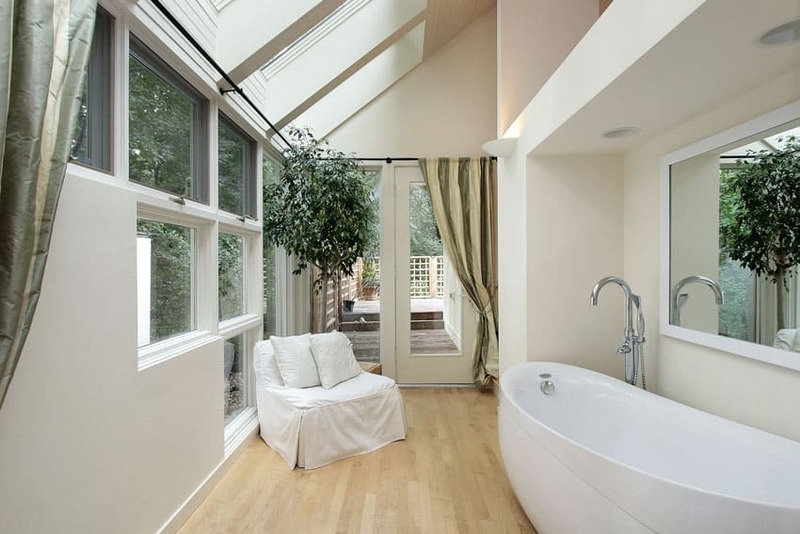 It’s the best choice if you wish you could have natural wood in your bathroom. That being said, engineered wood is still wood. It will stand up to moisture better than standard wood, but it’s still not going to handle moisture as well as a material like porcelain. Moisture can cause wood to warp and expand. To prevent this, you’ll want to make sure that you seal the floor properly. It’s also a good idea to use an adhesive between planks to make sure water can’t seep through the cracks. A good thing, though, is that wood won’t be as cold to step on in the middle of the night or first thing in the morning as tile would. 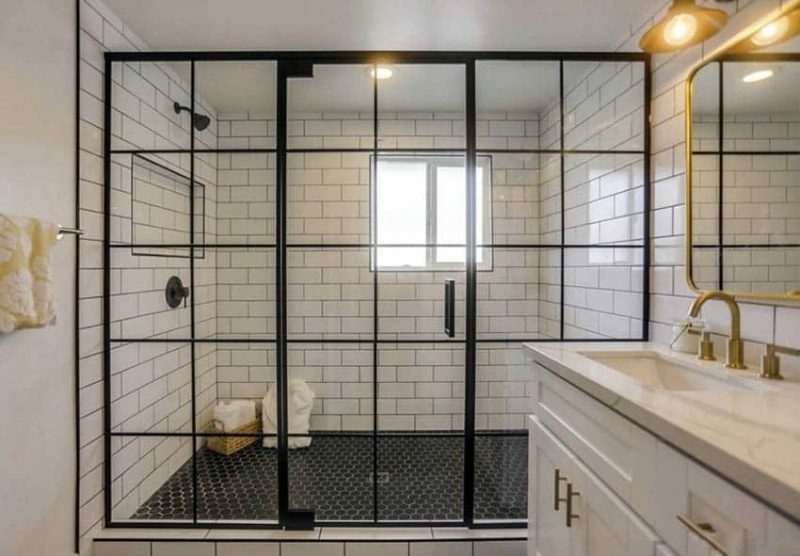 Metal tiles aren’t as popular for bathroom floors as they are for bathroom walls. However, they are a great way to add a modern touch to your home. You should also know that metal doesn’t have just one, industrial appearance. You can find stainless steel, metallic steels, and even glass hued steel. On top of that, metal tiles come in a variety of styles. While you can get a plain, smooth tile, many use imprinted patterns to bring texture to a bathroom. These could be simple geometric shapes but it could also be more detailed and artistic imagery. The latter is what is often chosen when metal is used in a backsplash or wall. Highly decorated metal tiles are mostly used alongside other tile types. Metal does do well with water, but it will get cold under bare feet. It can also be slippery when wet but more textured designs can work better at helping to prevents slips and falls. Pebble tiles also go by the name river rock pebble tile. As the name suggests, these make your floor look like it’s covered in small rocks – pebbles. This is a fantastic choice for homeowners who want a natural appearance from their floor. Thanks to their shape and texture, these pebble tiles lend themselves to an organic appearance even more than natural stone. The river rock pebble tile name is accurate as well as descriptive. Just like pebbles you see outside, getting water on your floor isn’t going to stain or ruin the pebbles. These aren’t a frequently used option, so you’ll have a truly distinct look in your bathroom with these pebble tiles. It should be noted that these floors are uneven. So, while not a set-in-stone drawback, some homeowners may not appreciate the feeling of pebbles on bare feet. This is usually minimized the closer together or more flat the pebbles being used are. One drawback that is set in stone is the aspect of keeping this type of flooring clean. Thanks to the elevation changes and sometimes tight nooks and crannies between stones, it can be hard to simply sweep or mop pebble tile flooring. The best tiles for your bathroom floor and walls depends on several factors including personal preference. For instance, what’s your price range? What features are you looking for? What appearance do you want the floor to have? The material that’s perfect for one person might not be what you’re looking for. 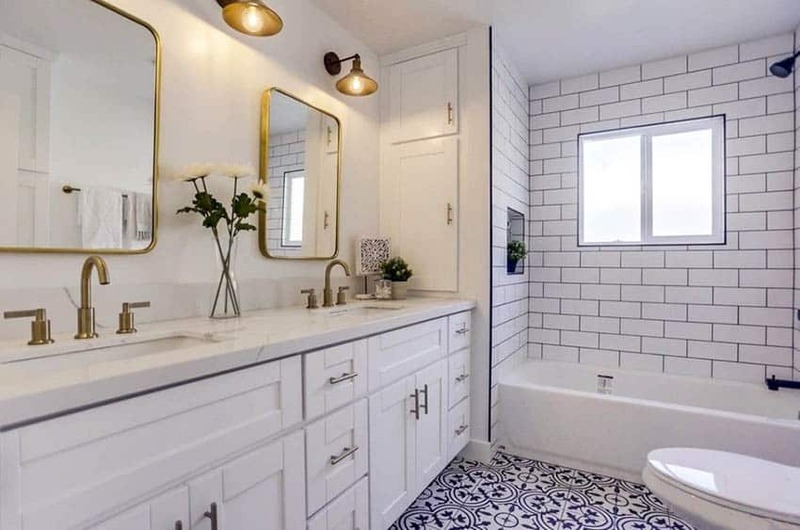 While these questions have to be answered personally, we can take a look at some of the most popular choices for bathrooms overall. By a landslide, the most popular materials are porcelain and ceramic tiles. This makes a lot of sense as these are affordable options. They are also a durable choice with an incredibly low water absorption rate, making it an effective choice for bathrooms. After these materials, more highly decorative options start to crop up. Behind ceramic, the next 3 most popular are marble, mosaic tile, and limestone. These materials are considered some of the more attractive options for a bathroom floor. In the case of marble and limestone, there are a countless number of naturally occurring designs. 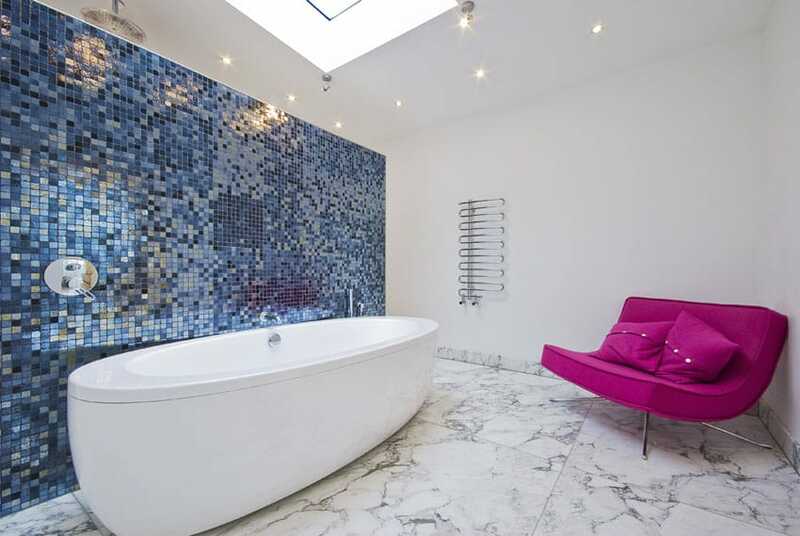 Mosaic tiles are also popular for their looks and they don’t come with as much of a cost as solid natural stone tiles. When designing a smaller room, you want to make sure that you make the right choice so that you make the most of the space. To do this, you’ll need to think purposefully. White tiles work well in a small space because it gives the room a bright, more welcoming atmosphere. Large tiles can also help create the illusion of more space. You’ll also want to consider tile patterns. Simply putting one ceramic square tile next to another isn’t likely to be the best use of the space. Instead, for example, give hexagonal tiles in a herringbone pattern a try to make the bathroom look bigger. If you want to use large square tiles, try natural stone tiles with an interesting pattern. Chevron stripe tiles are also a beneficial choice when trying to maximize the space and create the appearance of a larger room. You can also add a more spacious aesthetic by using the tiles you use on your floor in your shower. 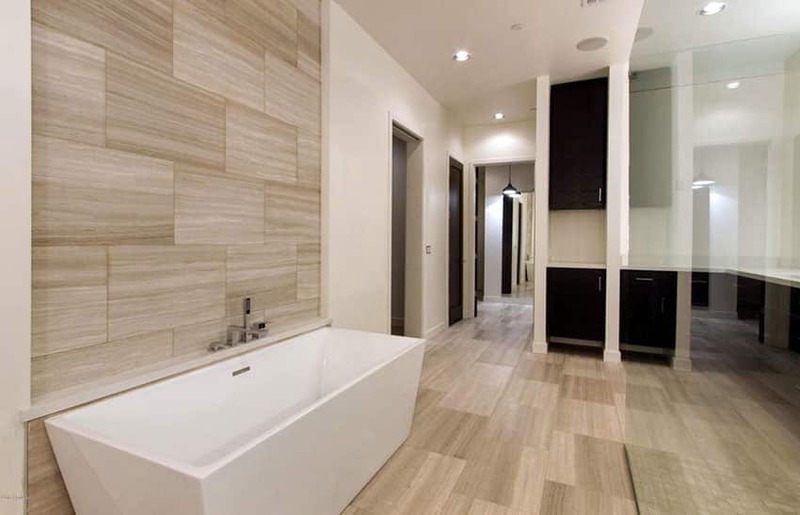 This type of seamless and uniform tile design makes the bathroom seem more expansive. If you are considering redoing your floors there are several bathroom remodel software programs that can help. Using one of these programs can help you create a design using your rooms layout and add your own finishes, tile and flooring to get the results you desire.